The Textured Stretch Series of casting and trolling baits from Mann�s have become world-renowned for their fish-catching ability and durability. Using a patented lip design, they run true, dive to their stated depths and feature a textured pattern, realistic finishes and rugged hardware to create the top selling choice for fishermen targeting a wide variety of fish. Mann�s is introducing a new addition to the series: the Textured Stretch 6+. Using the same body size and features of the popular Textured Stretch 15+ and 20+, the new Textured Stretch 6+ has been designed to run only 6-7 feet to stretch the fisherman�s catch zone to shallow water. The Textured Stretch 6+ will be offered in 12 fish-approved colors and will feature Eagle Claw� Lazer Sharp� Platinum Black� 3X hooks. The bait is 4 1/2 inches long, weighs 1/2 ounce and will be available in mid-2009. The HardNose� series from Mann�s has revolutionized the use of soft plastic baits. The patented hard nose prevents the bait from sliding down the hook during a hook set, thus producing more hookups per strike while the softer body provides a realistic action and feel that emulates natural prey. The HardNose� baits come in a broad variety of shapes and colors, including the new HardNose� 10� Floating Snake. The Floating Snake will float on the surface with a 5/0 hook-rigged Texas style. Upon retrieval, it has an action so closely emulating a live snake that even the fisherman will get nervous watching it approach him. In addition to being fished on the surface, the lure is a natural choice for use as a Carolina rigged bait. The Floating Snake will actually float off the bottom as high as the length of the leader. The lure has large painted eyes, a true snake shape, a scaled exterior and colors chosen to match the real thing. It will be available in 5 natural colors and an assortment pack. 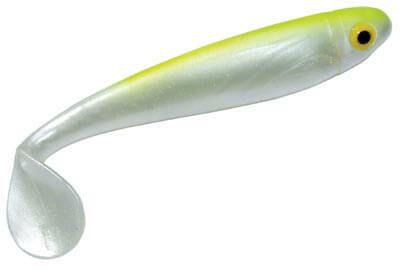 Also new is the 4-1/2-inch SwimShad. The new lure features a hollow spine from head to tail, a hook slot for easy rigging and the patented HardNose� head to resist tearing. Mann�s Textured Stretch Series of trolling baits have become world-renowned for their fish-catching ability and durability. Using a patented lip design, they run true, dive to their stated depths and feature a textured pattern, realistic finishes and rugged hardware to create the top selling choice for fishermen targeting a wide variety of fish worldwide. The latest addition to this series is the Stretch Alive. Featuring a four-piece, multi-segmented body that undulates and wiggles seductively while diving and maintaining its stated depth, the Stretch Alive provides the fisherman with a lifelike action not available in any other deep diving lure. Made with super-tough Polycarbonate for tough saltwater fish and large inshore species, the lure uses a proprietary hinge system specifically designed to withstand the abuse inflicted by large predatory game fish. The Stretch Alive will be offered with a textured body featuring 10 of the top fish-catching colors and will feature Eagle Claw� Lazer Sharp� 4X saltwater hooks. 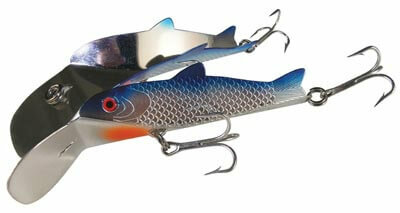 The lure is 9 inches long, weighs 3 ounces and will be available in mid 2009. Mann�s is also introducing a new Stretch Trolling Spoon. The spoon has a fish-shaped body and incorporates a diving lip that creates and maintains its intended depth. The lip also creates a vibrating wiggle causing the textured finish to flash brilliantly and intermittently like a real baitfish while creating a strong vibration to the rod tip. Another advantage of The Stretch� Trolling Spoon is that it does not roll over, thus eliminating the need for a swivel. The spoon is 4 � inches long and weighs � ounce. It will be offered in four fish approved colors and will feature 2 Eagle Claw� Lazer Sharp� 3X hooks with saltwater hardware. The bait will be available in mid 2009. 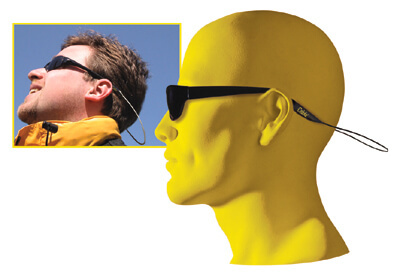 Nothing says summer like a sweat-soaked sunglasses tether clinging to the back of your neck. Besides feeling creepy and often smelling bad, those tethers have a tendency to come off. But, Cablz are not just another eyewear sock or cord. Cablz � made of surgical grade cable � are innovative, reliable pieces of equipment designed to keep your eyewear secure and stylish while staying off your neck. Every reputable tackle manufacturer offers a soft plastic swimbait to catch bass, or they're missing the boat. Regrettably, most anglers are forced to make do with their existing box of hooks, limiting the lure's true performance. A new, custom-designed hook called the Lip-Stick� Swimbait Hook from Northland Fishing Tackle ensures that soft plastic swimbaits track true, while providing bone-crushing hook-ups fish after fish! The hook is designed to work with all 4", 5", 6" and 7" soft plastic swimbaits. The design features a 45� wide-gap #6/0 worm hook that is available with two different "keel-weight" sizes for perfect balance and true tracking. Additionally, this sticky-sharp specialty hook has a self-centering CorkScrew� fastener to allow for easy rigging and to securely hold the bait while casting. The hooks are available in two weight sizes � 1/8-ounce and 3/16-ounce, and are molded on a custom 6/0 Lip-Stick� hook. For more information and a 2009 catalog, contact Northland Fishing Tackle� Inc., 1001 Naylor Drive SE, Bemidji, MN 56601. Phone is (218) 751-6723 or e-mail norfish@northlandtackle.com. Website is www.northlandtackle.com. Fishermen with a hunter's mindset will love ZackTack's new camouflaged Team Realtree� Backpack Tackle Box. The innovative backpack design provides anglers with a hands-free way to carry all essential fishing gear while displaying their passion for hunting. The camo Backpack Tackle Box will take you from the highway to the river with comfortable padded shoulder straps. You'll find lots of convenient storage in the large top compartment, five zippered pockets, a separate front compartment to access utility boxes and a rod tube holder. Plus, it has a handy feature you'll only find on the ZackTack � a built-in hood and shoulder poncho to let you cover up during unexpected rainy days. Made of durable 600D polyester with water-resistant PVC backing and a PVC waterproof bottom, the Backpack Tackle Box can withstand all that Mother Nature dishes out. From ample storage pockets to its durable exterior, the Backpack Tackle Box is created with an eye for detail and commitment to quality with no shortcuts taken in the design of this Team Realtree Signature product. The Backpack Tackle Box set is an outstanding value with four Team Realtree� utility boxes, a matching camo soft cooler, and a patented 6-foot QuikSlide� Stringer System. (Items may also be purchased separately.) It is available in Realtree APG HD� and Advantage MAX-4 HD�. To purchase or for more information on the full line of ZackTack products, check out www.zacktack.com, or call (888) 600-0907.